Seki comes closer and closer to discovery by the teacher in My Neighbor Seki Volume 7. Note: My Neighbor Seki Volume 7 is part of an ongoing series. Check out the review for Volume 1 here, and Volume 6 here. Otherwise, read on! Any time Robot Family comes out it puts a smile on Yokoi's face, and 85th Period is no exception. On the way to school, Seki finds a Robot Dog, and Robot Son wants to keep him. But because Robot Family wasn't the regularly scheduled distractions for the day, Seki can only play with them during homeroom and between classes. And when Robot Dog becomes careless and injures Robot Son, will the Robot Parents let him stay? 89th Period is perhaps Seki's most risky distraction yet. He uses a mirror to project a target onto Maeda's back, and plays darts using cockleburrs. But...is there really a chance that Maeda won't notice? Is Seki's string of good luck over? 93rd Period marks the return of Thief X. In this one, Yokoi is charged with returning an art book that was left behind in a classroom, but there is no name written in the front of it. There is, however, an 'X' doodled next to 'The Fifer,' who is curiously missing his titular accessory. As she flips through the book, it looks like Thief X may have finally gotten himself into some trouble. When Seki finally appears on the last page, how will he react to Yokoi's rescue of him? As the series progresses, it only makes sense that there will be bits of earlier adventures that make their way into later distractions, and that is perhaps one of the best parts of the series. An actual continuing story line wouldn't fit the premise very well, but the occasional callback feels like a reward for those who have read from the beginning. As Morishige allows his story to progress, perhaps he will find more ways to keep it fresh, as he has so far. Highs: I love the little bits of continuity provided from characters like Maeda. Lows: The more elaborate the distraction, like the one during gym class, the less fun the story tends to be. 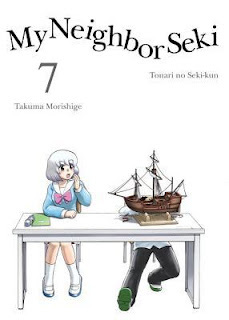 Verdict: Still fresh, still creative, and with a growing cast of characters, My Neighbor Seki Volume 7 is perhaps the best volume yet. Manga Monday: Does love have to be unplanned? Manga Monday: Time for a field trip!